The fall TV season has finally died down, with only a couple of new series still to debut next month, so that means it's time for us to fill our days with TV Club Classic, that fun feature where we pretend that it's perpetually 2003 and the tears we're crying are tears of joy. We've got a fun mix of old and new features coming up, but first, let's talk about a brand new form of TV Club Classic article, one that will involve you in a big way. 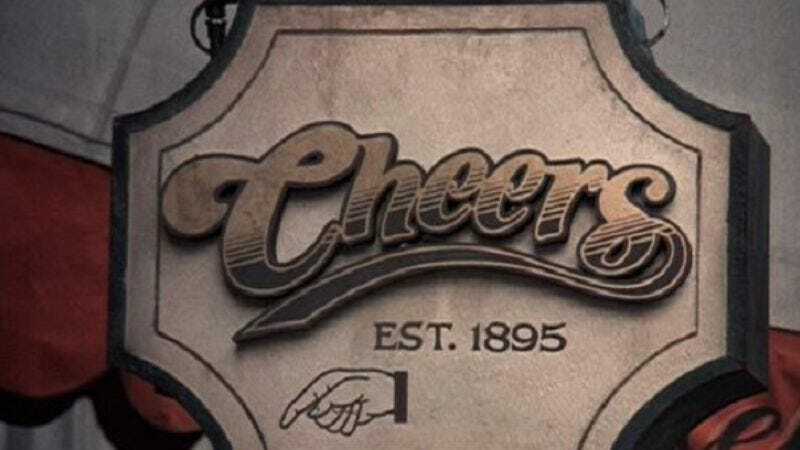 Beginning Thursday, November 10, several of your TV Club writer favorites will be going through Cheers, one of the greatest sitcoms of all time, two episodes at a time, with a format turned more toward discussion and conversation, rather than flat declarations by one reviewer. At least seven of us will be tossing the discussion back and forth, and we'll be opening up the floor for you to talk about the show, too, and incorporating your thoughts and comments into our own conversations going forward. It will, hopefully, be the TV equivalent of the late, lamented Wrapped Up In Books, and we're eager to get cracking with Sam, Diane, and the whole gang down at the bar. We might even have some very special guests drop by to talk about the show with us. (Don't get excited; "very special guest" just means our significant others. So they're "very special" to us.) New Cheers posts will go up Thursdays at 3 p.m. Eastern. What else is in store? Read below! And keep your eyes on this space, as we'll be announcing more TV Club Classic features to take the place of some of our soon-to-expire ones very soon. Every week at 11 a.m. (all times are Eastern), Myles McNutt will be heading back into the first season of one of the most influential comedies of the last decade, Scrubs. A show that's prompted many a great A.V. Club debate, Myles will be digging into whether or not Scrubs is, in fact, just the worst. (We suspect he'd disagree with that assertion.) He'll also be looking at the show's impact on comedies today. This feature will begin Nov. 7 and will focus on two episodes per week. Following up on his excellent coverage of Batman: The Animated Series (which will return at some point in the future), Oliver Sava dives into another series in the DC Animated Universe canon, taking on the first season of Justice League, a later series from many of the same people who worked on Batman. Tackling two episodes per week, Oliver will lay out just what made Justice League work so well compared to other depictions of these heroes. This feature will begin Oct. 31 and post every week at 1 p.m.
One of our most popular TV Club Classic features this summer, Hayden Childs' coverage of Avatar: The Last Airbender returns Nov. 1, and Hayden will run through the rest of the series until its end (with a possible short pause between seasons to visit one of the series' foremost influences). New articles will post every week at 11 a.m. He'll pick up where he left off, halfway through the series' second season. With the new movie coming up and all, we thought it was high time we started going through The Muppet Show, episode by episode, starting with the series' first season. And Erik Adams will return to one of the most inspired variety shows of all time beginning Nov. 1 at 1 p.m., each week working his way through more adventures of Kermit, Miss Piggy, and Fozzie Bear, hopefully so we can all remember who they once were before Hollywood inevitably ruins them as it ruins everything. Kyle Ryan's coverage of The Larry Sanders Show is also returning, but it's shifting day and time because we move things around just like a real network would. Continuing on with the show's second season (aka, the point where it goes from really good to one of the best comedies ever made), Kyle will be posting on the show every week at 3 p.m., beginning Nov. 1. Fresh off her triumphant coverage of the first season of The Real World (and her reunion tour, apparently), Meredith Blake will take on another pillar of the history of reality TV, as she goes all the way back to the summer of 2000 to revisit the show that essentially invented the modern reality-competition series from the ground up in its very first season. Hang out with Richard, Kelly, Susan, Rudy, and that cute girl who was in that Rob Schneider movie later every week at 11 a.m., beginning Nov. 2, as Meredith takes you through the first season of Survivor. Zack Handlen's coverage of Star Trek: The Next Generation, now slowly winding down, will continue posting as it always has at 11 a.m., while David Sims' coverage of Seinfeld, now entering the post-Larry David era, will continue to post at 1 p.m.
As mentioned above, Cheers will post every week at 3 p.m., beginning Nov. 10. Another of our most popular features this summer was Rowan Kaiser's coverage of Veronica Mars, and we're pleased to announce it will return beginning Nov. 4, posting every week at 11 a.m. once again. Rowan will continue covering two episodes per week, and he's now starting the show's often controversial second season. Noel Murray's coverage of Buffy The Vampire Slayer was one of the very first batch of TV Club Classic features back in the heady days of summer 2008 (and the first commenter to name not only the five series we covered that summer but also the first series ever covered in TV Club Classic will win the patented imaginary VanDerBadge), but Noel is just four episodes from the end, counting the one he's writing about today. As soon as he's done with the show's last four episodes and the end of the fourth season of Angel, he'll be taking a long break before returning with Angel's fifth season, so hang on to him while you can. New articles will continue to post every week at 1 p.m.
Todd VanDerWerff and Zack Handlen's coverage of The Twilight Zone will continue as it is at present, with two episodes being reviewed every week at 1 p.m.
Simon Abrams' coverage of Cowboy Bebop will also be returning, picking up right where he left off, roughly halfway through the series as a whole. His write-ups of the show's only season will resume Nov. 5 at 3 p.m., and he'll review one episode per week again. Christopher Bahn's coverage of classic Doctor Who will continue as usual, posting every week at 11 a.m. Finally, the question we're most asked is, "When will Nathan Rabin's classic Simpsons reviews be coming back?" And the answer to that question is… 14 weeks-ish from Sunday. Because beginning Nov. 6, Nathan's going to go through the first season of one of the first shows created by some of the people instrumental to The Simpsons' early success, The Critic. We know you're impatient for Simpsons season four, but we hope you'll join Nathan as he treks through The Critic every week at 3 p.m.
And, as always, you can make additional suggestions for series we should cover in comments. Sometimes we listen!